Hand Warmers - Stash busting! One of my fellow knitters loved it the first mitt so much that I offered to give her the pair when I finished. She’s a generous knitter, always making things for others so I wanted her to have something made for her. I’m glad they’re going to someone who’ll appreciate them. Almost done - need to seam the ends! Can you see the pattern? Maybe not! Yarn: Colinette Prism - 50% Wool, 50% Cotton. Two skeins of Gaugin. 1 – Pattern: Cast on 23. Every Row: *Knit 2, purl 2* until the last 3 stitches. Knit 2, purl 1. Slip knitwise the first stitch of each row. Knit to desired length. 2 – Another “no rush project”. I left it at work as a lunch project. After not knitting for a week or so, this was the first WIP project I picked up and I ended up be pretty motivated to finish it. 3 – I think the mistake rib pattern gets lost in the Gaugin colorway. 4- I would like to fringe this scarf but I don’t feel like buying a third skein of Colinette. I’ll keep my eye out for a less expnsive alternative. 5 – Chances are this will be a gift around holiday time. Yarn: Colinette Prism - 50% Wool, 50% Cotton (so, so soft!). One skein each in Mushroom and Umber. The availability of yarn for fringing depends on how long you make your scarf. 1 – Pattern: Cast on 23. *Seed stitch for 4 rows, switch yarn. * If you want smooth edges remember to slip the first stitch knitwise for each row. Knit to desired length. Fringe optional. 2 – I started this in January as a “no rush project”. I left it at work as a lunch project. However I quickly got it done this month when I realized I wanted a scarf for the baseball playoffs in October. - I started the scarf with brown and I ended with cream. - When it came to fringe I decided to use cream fringe on the brown end and brown fringe on the cream end. - The other fringe option was to alternate brown and cream tassels. - The fringe is quite straggingly – I didn’t bother trying to even it out. 4 – With the fringe the scarf starts at one knee and ends by the other one. It’s really long. 5 – I weaved the alternate yarn so I didn’t have to “cut and seam”. This method was shown by Knit1’s Adina Klein on a recent episode of Knitty Gritty. And I thought I came up with it all by myself! The Persian is inspecting the handiwork. This is the shawl unblock – honestly a couple of more skeins and I could have turned this into a bedspread! Yarn : InCanto #7 – Lime (even though there’s a lot of orange!) I believe its 50% cotton, 50% linen. # of Skeins: Pattern calls for 4 but use 5 skeins if you want additional length. 1 - It is an easy pattern but you do need to concentrate. 2 - The shawl benefits from a loose knit – you won’t need much blocking. Even though I can spot every mistake I made I do love how it turned out. I’m already thinking about frogging it to fix those mistakes, but I knitted so much of this shawl while spending my evenings with Wembley (she slept next to me while I knit) - the shawl reminds me of her so I’m going to let it be. It drapes nicely. I used an extra skein of yarn to add some rows that allow the shawl to stay wrapped across my shoulders (as oppose to the ends falling down after every movement). The longer length also allows the shawl to be used as a sarong. On Sunday I brought it over the Stitch Therapy and showed it to the owner, Maxine. She said it was the only one she’s seen that doesn’t need blocking – I mentioned that after the first skein I started to knit in a looser gauge so that the stitches would flow better over the needles. She thought the looser gauge allowed the shawl to stay flat. I mentioned quickly that I was going to knit my husband an sock for his iPod. Chris asked “Does it need to be manly?”. Well my first color choice was red, for Valentine’s Day, but then I thought a blue would be better. I wanted to knit the sock in the round. I used the toe up method but it came out too big. Ok, now it’s actually Valentine’s day and I was left to with the old “seam up the folded rectangle” method. I finally finished it as the "Best in Show" dog was being selected at the Westminster Dog Show. Now that’s cutting close. 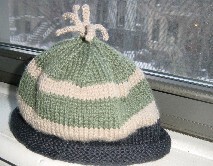 Pattern: 2x2 rib: cast on 32, knit until twice desired length, bind-off, and seam up sides. 1 – Although Koigu is tiny the knitting went quickly. The sock is so soft and very nice to the touch. I need to find another project using Koigu! 2 – The sock used approximately 20-25 grams (just under half a skein). Sadly, judging by this knit, if I ever made a pair of real socks out of Koigu I would need 3 skeins. Now that's a pricey pair of socks! 3 – Surprisingly, this looks like it needs to be blocked. It looks quite rumpled! I love the feel of Colinette Prism. I was seduced by the colors in the Gaugin colorway. Rita from Downtown Yarn has just sold out of it and offered to order 2 skeins for me. It's a mistakes rib scarf for me! 1 - Cast on 31. Repeat steps 2, 3, 4. I also worked on another project using Diakeito Diadomina which is wool /nylon /mohair mix. As I was knitting I came across a possible design that I may want to submit to Knitty, so mum's the word for now. I've quiclky jotted down how I made these two pieces, evidently I've worked on enough hats and scarves that I makeup my own patterns nowadays! I'll check it for technical details tonight. Colorway – Broughton (navy, green, burgundy) – very pretty selection of colors, there was a nice cream, beige as well as a vibrant pink fuschia. Needles used- Scarf - #15 Inox straight needles, Hat - #13 Pony Pearl dpns. Yarn needle for finishing the hat. 1 - I got a chance to look at the pattern book for this yarn and there was an amazing coat. I think it needed something like 15-20 skeins of yarn but you could always shorten it to a mid-thigh length or even a car coat. 2-*k1, p1* until desired length. 3 - If you fringe you will need another skein of yarn. 1 - Great commuter scarf, all folded up it makes a great pillow! 2 – I really hate to give this away but I don’t have a need for a bulky scarf! 1 - Cast on 48. divide evenly onto 4 dpns. 2 - *K1, P1* until piece measures approx 6 inches (longer if you want coverage for top of ears). 3 - Decrease rounds: k1, p1, knit 2 together, *k1,p1 until end of stitches on needle. You are decreasing 4 stitches every round. 5 - Repeat until you have 4 stitches on each needle (16 total). 6 - Knit 2 together, resulting in 8 stitches remaining. 7 - Kitchener stitch to close and finish. 1 - The thickness of the yarn screamed for a simple stitch. Pattern: Cast on 32, garter stitch until desired length is reached. 1 - Great yarn, alternates between soft wool and boucle. 2 - Would be great to use with various patterns developed for Noro fiber. 3 - I kept this project at work - I was able to work on it every so often at lunchtime so the garter stitch didn't seem tedious. I was able to bring it to knitting circle as well on nights I knew we'd have lots of conversation. 1 - Easy pattern but you do need a row counter and a chart to keep track of the repeats. It was greater commuter knitting 'cause the first three stitches told you what you needed to do for the next two rows. 2 - Good project for a new knitter who wants to move beyond stockinette and garter. 3 - I create a giant chart but you really don’t need it. Just make sure you use your row counter and make sure you remember which side is the “right” side. I flipped the counter for every two rows so my counter always showed an even row. Then I followed the instructions for the next odd row. Husband originally wanted the cap I made the nephew. Made this one for him instead. My first project to be "knit in round" using Addi Turbos.